Going Mac | Real Estate Realities With "The RebelBroker"
Well, I suppose that title is a little misleading. I have always had an Apple computer on my desk. At least since about the sixth grade. However, I have also had either a DOS or Windows based system sitting right next to it. I started off with a Leading Edge Model D running DOS right next to my Apple II+. I was a geek of historic proportions. As time went on, the hardware got better, but never dedicated to a single platform. I have always had both. As things shook out, my DOS/Windows machine ended up being for games. My Mac, for serious work. 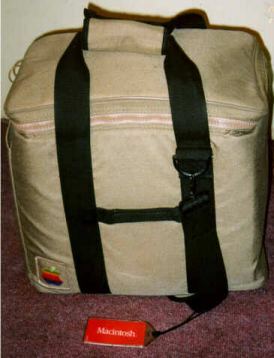 Back when I first got started in real estate, I was one of those guys that treated the old Mac Plus as a “portable” system and even bought one of those cases designed to let you carry it around! I even had a case for my Imagewriter II! I would bring it into my real estate office and set it up. Or even in the back of my car – with the help of a power inverter to run it off the power from the lighter! I had scanned in all the important real estate documents and would print them out on my dot matrix printer after filling them out on my Mac Plus! This was back in 1989 and NOBODY else was doing it – at least nobody was willing to admit it. With my external disk drive, and later my highly sought after 60 megabyte external SCSI drive, I was hell on wheels! So I tried to live in both worlds, but it got annoying. Particularly in the world of real estate. The office I used to work with had a system that required the latest version of Internet Explorer – available only for windows. The association of Realtors had some good software for creating forms, but it only ran on windows as well. So, I had to continue my split existence. I could not just do all my work on a Mac – I had to do some of it on windows. At least, that was the case until Apple switched to the Intel processor a while back. Now I can install windows onto a Mac and run all the apps I need for business! Not only that, I can choose a variety of ways to do it. I can create a “Boot Camp” volume on my mac where I can install windows, then I can boot up right into the windows operating system as if I am on any other windows based machine. Or, if I want to keep my Mac OS running, I can run Windows… IN a window! Using an application called “Parallels”, I can open windows in a window and run whatever I need. I can print, use devices connected to my mac via usb, firewire – whatever! It is fantastic! Even better, I can easily move documents from my Windows Window to my mac environment to use my Mac applications to open the file! So is there a downside here? A bit. I like to play computer games. Most of the really compelling games come out on windows. So, if you want the best performance, you still need to run on a windows machine. This is really because of graphics cards more than anything else. Once graphics cards manufacturers start building in Mac compatibility to their cards – I suspect it won’t be long before I can toss my windows dedicated machine out the window. This entry was posted	on Sunday, July 20th, 2008 at 7:54 PM	and is filed under Uncategorized. You can follow any responses to this entry through the RSS 2.0 feed. You can leave a response, or trackback from your own site.